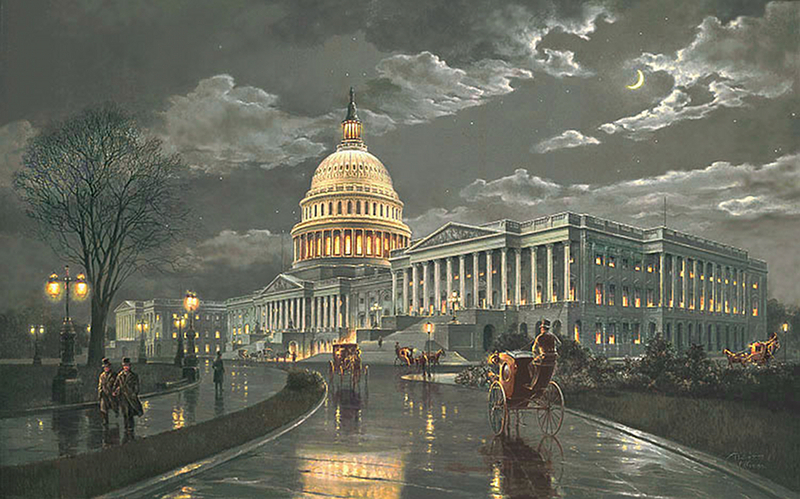 "The Capitol by Moonlight" by Paul McGehee. It was a time of great excitement in Washington, D.C. In the winter months of early 1905, the nation's capital was preparing for the second term of President Theodore Roosevelt, a popular and forceful leader who had been reelected by an unprecedented majority of votes. On Capitol Hill, horse-drawn hansom cabs and carriages brought congressmen, senators, and their staffers to work on legislation in one of the most beautiful and impressive buildings in the world. The great dome of the National Capitol building seemed to glow against the evening sky, illuminated from above by electric lights during night sessions of Congress. The Statue of Freedom, perched atop the immense iron dome, crowned an architectural masterpiece of white marble and sandstone that took many years to complete. The concept of a Capitol building as conceived by Pierre L'Enfant and George Washington was to create a "Federal House for Congress." After Washington laid the cornerstone in 1793, the ensuing construction was to endure many setbacks: funding, missed deadlines, plan changes (under the guidance of a succession of architects) and, most devastating of all, the burning of the Capitol by the British in 1814. The building was redesigned and rose again "like a phoenix from its ashes," and through the next half-century was completed section by section, finishing with the dome in 1863, during our country's Civil War. Over the years, the National Capitol building has come to be a shining white symbol of what Abraham Lincoln called the "last best hope of mankind," a symbol of a nation created "of the people, by the people, for the people." 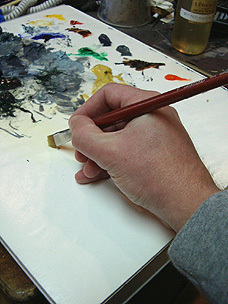 In perfect condition, hand-signed Artist's Proof. Print image size 20" x 32". Only one in stock.